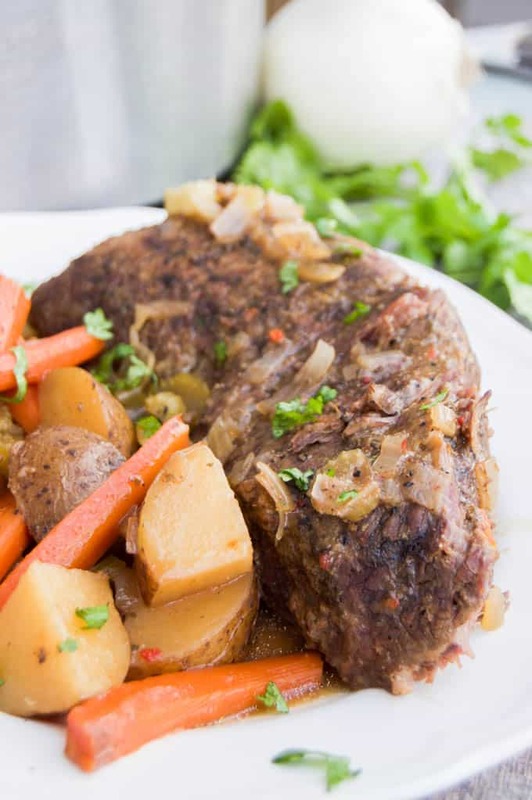 My favorite recipe so a simple and juicy Slow Cooker Pot Roast. 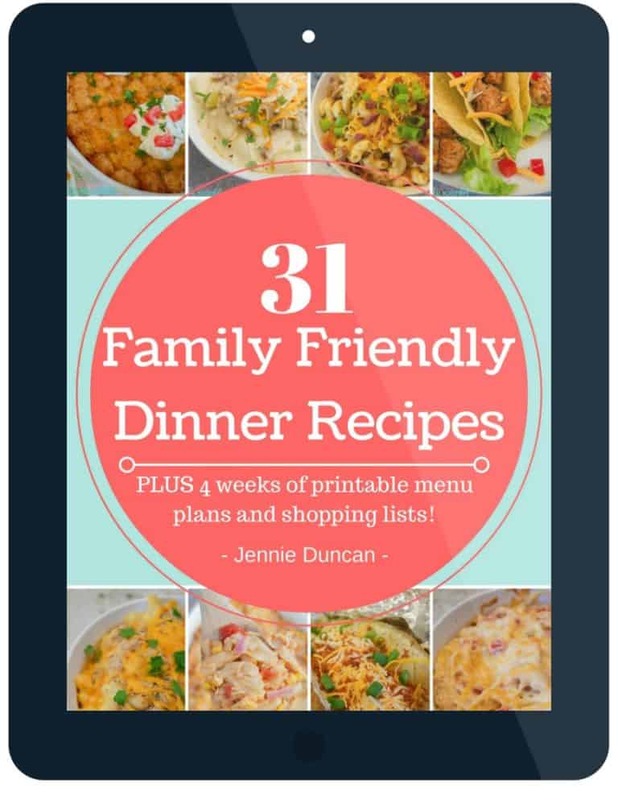 Loaded with veggies and full of flavor this recipes is a must try and one that will be on my menu again. 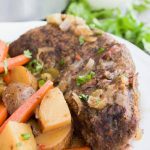 This Slow Cooker Pot Roast brings me back to my childhood! Since you need to cook the roast most of the day my mom would let it start cooking on low first thing in the morning on Sundays. We would come home from church and the entire house had an amazing smell! 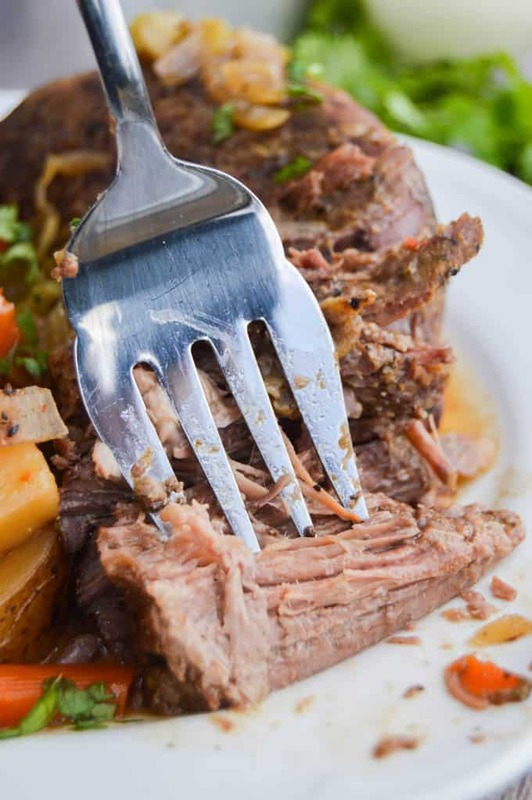 My mom made the best pot roast and I hope you enjoy this recipe as much as we do. Start by placing the roast in the slow cooker. Then place all your diced veggies around and on top of the roast. In a small mixing bowl add 1 cup water. Add in ranch seasoning, zesty Italian, and brown gravy. Whisk together then pour over ingredients in the slow cooker. Place slow cooker lid on. Time to cook! I prefer cooking my roast on low. If you cook it to high it can cook to fast and be to tough. I cooked it on low for 8 hours. Your roast sound be able to fall about when touched my the fork. I typically use a chuck roast for the recipe. You want to make sure it looks marbled with fat to make sure your roast is not to tough and also not to fatty. I also always buy bone out roast. You could also use a brisket or round roast. Just remember that low and slow is the best option. time can vary while cooking depending on the size, shape, and coloring of your roast but on average I find that 8 hours on low will do the trick. 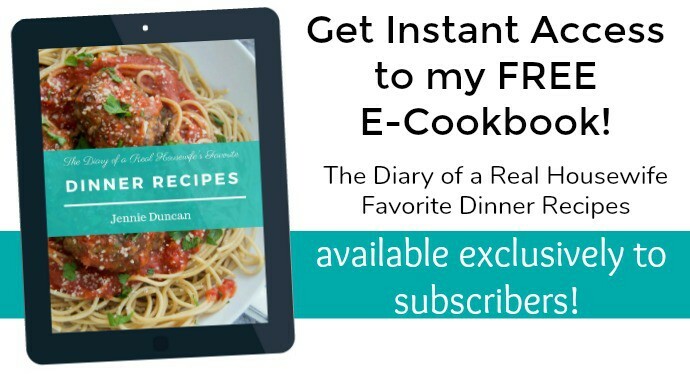 Want more slow cooker recipes? Add roast to the slow cooker and places veggies around and on top. In a small mixing bowl add 1 cup water. Add in ranch seasoning, zesty Italian, and brown gravy. Whisk together then pour over ingredients in the slow cooker. Place slow cooker lid on. Thanks so much for pinning it Brenda!! There is nothing like a great Pot Roast, this looks delicious. Thanks so much for sharing with Full Plate Thursday and have a great week. 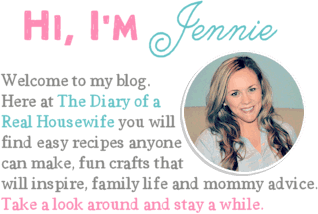 Thanks Helen for hosting the linkup!! Looks yummilicious, Thanks for the recipe, I’m trying this tomorrow. Thank you, hope you enjoy it! !